Hi everyone! I am back home now after a week in the hospital. More about that later perhaps, but for now I am trying to catch up around here. My usual monthly article for The Japan Times appeared last week, and it was all about Japanese style curry. If you've ever wondered how curry got to be so popular in Japan, and why Japanese curry is so, well, different from curry you get elsewhere - head on over there and take a look. (I especially loved finding out about the Great Curry Scandal of 1931.) It has a recipe for a proper, rich beef curry using curry mix (curry roux), which is the easy way to do things of course. (If you're interested in a from-scratch curry recipe, check out the Beef Curry recipe right here on this site, as well as my Dry Curry recipe. And if you have leftover curry and are feeling ambitious, I have a recipe for Curry Bread (kareh-pan) too! And here's the English packaging, which is the one you see more often when Vermont Curry is for sale outside of Japan. I've also seen packaging in Chinese and Korean. Have you seen it in other languages? And in this version (which I can't embed at all unfortunately), Hideki even lives in a cute little apple house in a snow-covered landscape - presumably, Vermont. Looking at the list of ingredients in Vermont Curry, honey and apple are indeed listed - along with tons of other recognizable and unrecognizable stuff. This is an industrially produced food product after all. So, why Vermont? The Green Mountain state is certainly not known for their curries I don't believe. The key, as you have probably guessed, is the apple and honey part - but why specifically Vermont, a relatively obscure (for non-Americans anyway) state? Even most Americans in 2011 don't think "Vermont" first and foremost when apples are mentioned. Well, it's all because of a health fad of sorts that was very popular back then. In 1958, D. C. Jarvis, a country doctor in Vermont, published a book called "Folk Medicine: A Vermont Doctor's Guide to Good Health", which stayed on the New York Times bestseller list for 2 years, and was (according to the good doctor's Wikipedia page still in print up until 2002. You can still get a used copy now. One folk remedy that particularly captured the imagination of people was the use of a mixture of apple cider vinegar and honey, called honegar, for anything that ailed you. The popularity of this magical mixture eventually spread to Japan and was known as the "Vermont Health System (バーモント健康法）". So when House Foods introduced their special, sweet and smooth curry in 1963 (even though the mix includes other sweetening agents besides honey and apple), they latched onto this "healthy" combination, blithely changed the apple cider vinegar to plain apples, and voila! Vermont Curry was born. Isn't marketing just grand? Nowadays of course, barely anyone remembers just how widely popular "honegar" was, though the popularity of using apple cider vinegar, or other vinegars for that matter, as home health tonics lingers on. (Readers have pointed out that honegar is still available in some areas.) The most recent 'healthy' vinegar fad in Japan was for kurosu or "black vinegar", an aged rice vinegar. This stuff was wildly popular as a weight-loss aid until around 6-7 years ago, and they still advertise "40 year-aged" kurosu and kurosu supplements on Japanese TV. (My favorite happens to be kurosu flavored candy, which probably defeats the 'healthy' purpose.) Thankfully perhaps, no black-vinegar flavored curry mix emerged from the fad. Vermont Curry is now available in three degrees of spiciness - amakuchi (Mild or Sweet), chuukara (Medium Hot) and karakuchi (Hot), but to me the one real Vermont Curry is the Mild one, which can be served to a small child or an excessivly timid-about-spiciness adult without compunction. Incidentally, manga and anime fans may know Hideki Saijo via the Chibi Maruko-chan series, which is set in the mid-'70s when his popularity was as its peak. Hideki is still in showbiz, though he's transitioned into becoming a TV presenter and occasional actor (he's not too bad either) rather than a pop singer. Submitted by maki on 2011-09-07 12:32. What a fascinating story! I prefer the S&B curry, but I have seen the Vermont Curry here in Australia. Honegar is still around - a popular version here uses cider vinegar and Manuka honey from New Zealand, which is supposed to have antibiotic properties and therefore very therapeutic. If you have dark hair, cider vinegar makes an excellent rinse to make your hair smooth and shiny - try 1 tbsp of cider vinegar (or honegar) in 1 pint of warm water - it really works! I have to say, though, as someone often made fun of in the States for having a weak tolerance for spicy, it feels good to be in Japan, where I can most things (especially curry) as spicy as they come and only enjoy it. The video you couldn't embed is truly exquisite, too. How interesting! Here in the States if you add "Brazilian" to anything it sounds exotic and thereby worth $40.00 more (like waxes and blow-outs). I'm going to have to look into curry with honey and vinegar, since that's nothing I'm seen. My family isn't much for curried dishes, but perhaps I haven't found something that plays to their tastes. glad you are back on your feet maki! best wishes that your recovery continues smoothly. this is so interesting re: vermont curry! i almost never buy the mild version, but after reading about the origin i want to try it. what a clever marketing ploy, and so strange that such a random, folksy american remedy would persist so resiliently in a dish around the world! "three degrees of spiciness - amakuchi (Mild or Sweet), chuukara (Medium Hot) and karakuchi (Hot)"
I'd live to see the Japanese written out so I could more easily buy the Japanese curries I see in the shops here (SF bay area). We even have a box of Vermont Curry in the cupboard that we got at Berkeley Bowl as an "experiment" which we'll definitely partake of after your informative essays! It's great to hear that you are recovering so "soon". I think many of your fans agree with me that we get really worried. Since you truly are an greatwriter/journalist and sharing so much of your personality on this site it almost feels like knowing you a little. I really enjoy reading your articles in the Japan times. 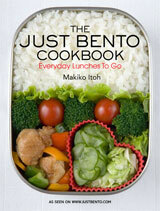 You could write a novel (or several) on Japanese fads and random cultural obsessions they have. When I was there in the 80s, coffee was a huge fad and everything from jello to chewing gum came coffee-flavored. Australian frilled lizards were also everywhere at the time - stuffed ones, on cartoons, childrens' clothes, etc. I think the Tokyo zoo had acquired one. A newer food fad is the rise of Japanese mayonnaise consumption. It seems like even in the States, Japanese restaurants are serving more and more mayo-laced food. As someone that grew up hating mayo, every time i see that kewpie I want to barf. Hi Maki, I'm glad you are feeling better!!! I used to love Japanese instant curry but I found out all the brands carried by my local store have MSG, and that gives my wife migraines (and I'm also starting to tolerate it less and less I believe). Is there a MSG-free instant curry? So glad that you are back! Now take care and stay well. As it happens, over the last few days I've been reading your curry articles and have been wondering about the Vermont curry. Thanks for clearing up the mystery. I may give it a try. I've always wondered why it was called "Vermont" curry! Wow-- that commercial totally brings back memories. 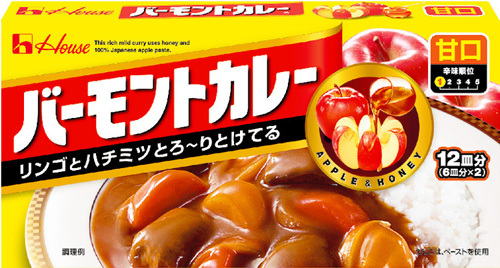 I remember that as a kid, I wanted curry to taste like honey and apples, but it didn't. My mom never bought the mild version-- we always had medium hot. Hope you're feeling better, Maki. Welcome back Maki! You were sorely missed. Thank you for the fun trip down memory lane. Incidentally, my mother always combined the amakuchi and chuukara curry bricks. I've just found your website and really enjoy it. Thank you very much. I'm glad to hear that you are feeling better and send many wishes for a speedy and total recovery. So glad to know you are back up and at it. Thank you for demystifying House Vermont Curry. As a child I spent a lot of time in Vermont and my parents chose it as their place of retirement. There are indeed a lot of apples but that never seemed enough to merit the name. It's been a mystery to me since arriving here in Japan in 1985. Thanks for clearing that up. Whew! Once less thing. Happy to hear you feel better and are home, far away from hospital food. A question, is this kurosu or aged "black vinegar" you mention even remotely similar to balsamic vinegar (aceto balsamico)? I come from the "centre of origin" of aceto balsamico and I'm curious. In its best (and authentic) incarnations it is a black and fragrant thick liquid, and it is aged for many years: 40 years old balsamic vinegar is not unknown, 20 is almost normal, 12 years is the minimum for the real stuff "Aceto balsamico tradizionale di Modena o Reggio Emilia". A very different beast from the sweet&sour stuff that is sold in many shops around the world... It can cost you a lot of money too. Nobody has (yet) attached any health giving property to it, to my knowledge. Aceto balsamico making used to be a posh hobby for land-owners, as you need a very productive vineyard and a rather big house, with a large and clean attic for aging the vinegar. You also need a lot of free time to spend pottering about with barrels, measures, and so on. Glad to hear that you're home, hopefully you're feeling back to normal. Hope there won't be anymore trips to the hospital, heaven knows you're already spent too much time there! It was Japanese curry that got me into liking curry. Before I went and lived over there, I didn't like curry of any kind, though I hadn't tried the Japanese style yet. It was probably Vermont Curry - or something similarly mild and "sweet" (to my palette, not even the mild is truly sweet) - that I first tried and liked. From there it was on to curry pan and Indian curries, and I've never looked back. If you ever get the chance to visit Kawagoe, in Saitama-ken, there's an excellent curry restaurant there. All of their curries are house-made, and you can get it from mild to insanely hot. I'll have to see if I can find the name of it; my husband and I always just navigated there from memory. OMG.. I just bought a pack of Vermont medium curry on a whim yesterday... Get out of my mind Maki! Anyway good to hear you're out of hospital! Hope you're on the way to a complete recovery. Great article Maki! During my first visit to Japan our guide would eat twice every night. First some local specialty with our group, and then later in the evening he had to have his curry. This really confused us :) but now I realise it must be his childhood comfort food or something. I have a non-food related query. I understand that ringo is usually written in kana, but why has it been written in katakana and not hiragana on the packet. Is it a Gairaigo? Hi bv, Scientific/botanical/zoological etc. nouns are also katakanized, even if it's just the common name. I think the use of katakana on the packaging is just a design decision. While there is kanji for ringo 林檎, it's usually written out as hiragana りんご　or katakana リンゴ, possibly because it's such a ubiquitous fruit. The use of hiragana or katakana is also more kid-friendly, and remember that Vermont Curry was originally a "kids' curry". Thank you for posting an explanation about Vermont curry! I've been curious for a while about it; I was born and raised in Vermont. I'd never heard of "honegar". XD We really do have beautiful apples, though~. Vermont clover honey is too musky for my tastes, however. The next time I'm out shopping, I'm definitely going to find some Vermont curry because I've never tried it before~. When I was visiting Japan as a kid, I heard the jingle on tv and could not for the life of me figure out what that middle word was: "Ha-oo-soo BAA-mon-toe Ka-ray"
Barmont? Bamonto? Was that some special variety of apple? A Northern Indian cooking style? So. Baffled. A decade and a half later, I finally saw an English package and all the seemingly inconguous images of bouncing apples, rolling hills and honey dripping off everything fell into place, my personal HVC Mystery was solved! I'm really glad that you are back! I love today's topic because I grew up on eating Vermont curry! My mother makes real good one, and as I growing up, I started liking hotter flavor. Currently, when I make curry, I mix Amakuchi Vermont & karakuchi Java curry, and it will taste better than ever! I usually put some Surioroshi garlic and apples as secret ingredients. Cool. What a fun bit of history. Mixing honey or maple syrup with vinegar is a traditional drink, like lemonade is in other places. Wow! I have been wondering about the name every time I buy my usual blocks of curry mix. Is it actually a sweeter taste than S&B or Java curry (my mom used S&B, I switched to Java because I liked the flavor better)? I have been eating kare since I was young but never tried Vermont since I was confused about the apples and honey (thought it was something odd like apple-flavoured curry). Maki glad to see you home! Thank you for sharing the mystery. I saw this curry in one of the oriental grocery stores I shop at and thought -- well, that can't be authentic! Now I'm trying to remember which one so I can go back and pick some up! Thanks for explaing the mystery! As a young child I had visited Vermont, then moving to Japan I thougth that everyone in Vermont ate curry. The crazy kid's mind! I personally blend the S&B and Vermont brands. I think it's a good combination. I once bought an apple cider vinegar and honey drink. It was clearly a "health food" but I didn't realize it had a specific history. It was actually pretty tasty on a really hot day. Thank you. I ran across VT curry on Amazon and I've been trying to figure out why VT ever since. Our best guess was that they tried to figure out what state was associated with apples, peanuts, bananas, cheddar and gouda, gave up and threw a dart at a map. This also explains why honey and not maple syrup.